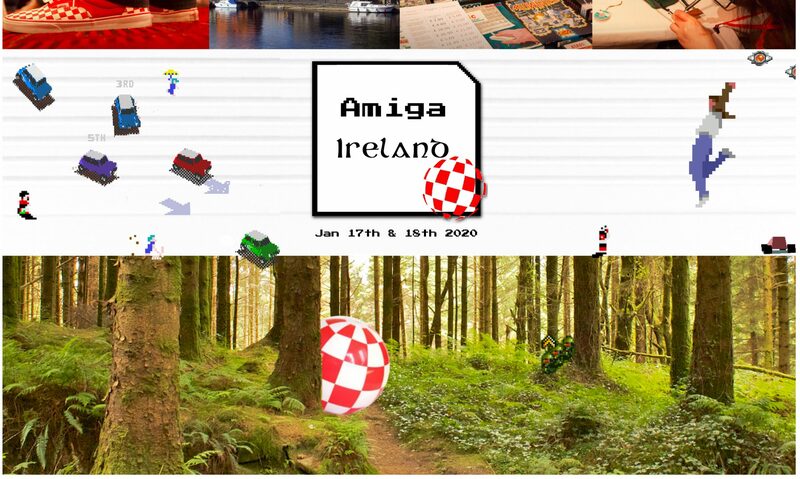 Amiga Ireland – Events for Amiga and Commodore fans in Ireland and our friends overseas. There is something for everyone whether you are into games, hardware, software, demos or just meeting like-minded people. Game Competitions including SWOS, Stunt Car Racer, Paper Plane and many more where the winner will be immortalised. See previous trophy winners in the Media section. Any game you like can have a competition run and there are often spontaneous competitions such as Speedball 2 and Tower of Rubble in 2019. If there is a free machine and you’re willing to approach people to compete, that’s all it takes! Exhibitions to see and try out the latest developments for classic Commodore / Amiga machines such as WiFi, Dropbox, Web browsers, accelerator cards. See the current Amiga computers released such as X1000 and A1222.Classics such as the Amiga 500 (and plenty of them! ), A600, A1200 & A4000 are also regularly present. There is usually at least one Vampire machine an site as well as Raspberry Pi solutions such as AmiBerry. Social aspect is important too and we go for a VIP meal on the Friday night (limited to VIP ticket holders) as well as head to a cozy and atmospheric local pub on the Saturday night (some of us don’t drink so come anyway!). On Sunday morning, there is an unofficial/casual gathering in a local pub that serves breakfast for anyone who can make it. Niall Ó’Brolchain (Ireland’s first commercial game (C64). Former member of Seanad Éireann and Mayor of Galway City). We downplay these because the donation-based nature of prizes makes them inconsistent each year. But we’ve had some real gems since the beginning. Every year we have trophies for two of the gaming competitions and Amiga Ireland Champion Floppies for others. People have won WiFi cards for classic Amiga, boxed games, assorted hardware, books, magazines, manuals & posters. In 2019 we had a boxed Amiga 500 donated (and we changed our spot-prize format to a ticketed raffle to raise funds for the Computer & Communications Museum of Ireland as well as Amiga Ireland on this occasion – 50/50). We are very grateful to our sponsors for their support both during and between events. Shopping For retail therapy, hardware and software vendors will be there as well as other products such as KA Plus Magazine and retro retailers Amiga Kit. You can sell and buy on the day and you will meet the people who made and make Commodore and Amiga possible. Workshops: Learn how to do new things on Amiga. We run about four workshops at the event. These are presented on overhead projector and the presenter has a microphone. We select according to availability of teachers as well as by conducting a pre-event survey to see what demand is like. Soldering (this one requires enough demand as well as people to bring sacrificial hardware to practice on. Never make your first attempt at soldering on hardware you value. You will not be disappointed. Meet like minded folks who are flying in from all around the world (Ireland, Greece, Holland, Norway, England, Scotland, Poland, Germany, New Zealand, and more) and country and immerse yourself in the past and future of Commodore and Amiga loveliness. Attend & participate in the entire event from 1pm on Friday until 7:30pm on Saturday. Socializing in a reserved area of Gerty Brown’s Pub on Saturday night from 8pm until late. Sunday morning unofficial gathering until lunch time. With the exception of the Friday night, meals are not covered by this ticket. Eat at times that suit you. Fri + Sat includes everything except the meal on Friday. Eat at whatever time suits you. Ticket does not cover meals. Coming from overseas? From Dublin Airport or Dublin City itself there are a few options. Direct from the airport to the event location. A comfortable two-hour journey on the X20 coach costs EUR 24 (return trip) and includes WiFi. Large luggage can be stored underneath the coach. Just make sure you get off in Athlone station as it continues to other destinations! You can book a seat on the X20 up to one month in advance at this link. Use Dublin Airport as the origin (there are four stands but they are all adjacent, so choose any) and set destination to Athlone. View the full timetable at this link. Competitive rates are possible using this service for ~EUR 20 per day. From the airport, the 748 bus goes to Heuston train and bus station but can take up to an hour in heavy traffic. It costs EUR 10 return. Alternatively, a taxi to Heuston station could cost over EUR 30. The train service leaves Heuston station and stops in Athlone before continuing on. The train costs EUR 30 return and takes 90 minutes. If you are coming directly from the city center rather than the airport, the train is the fastest way to arrive. The venue is The Sheraton Hotel in Athlone. The venue is a seven minute walk from Athlone station where the bus or train will leave you. Taxis are available. Map. Phone the organiser, Iarla on +353 87 993 2250 if you have issues.